I have a great reluctance to follow rules, even when they are imposed by myself. Having said I would cook my way through The Great British Bake-Off Big Book of Baking in order I find that this is the one thing I cannot do. I am also not very good at following the recipes as I never have what they stipulate so have to substitute something else. Anyway I was glad I jumped ahead as earlier this week I made these delectable lovelies. Based on the recipe from p.35 of the book I substituted walnuts for pecans and just made a dark chocolate rather than a dark and white chocolate ganache filling. 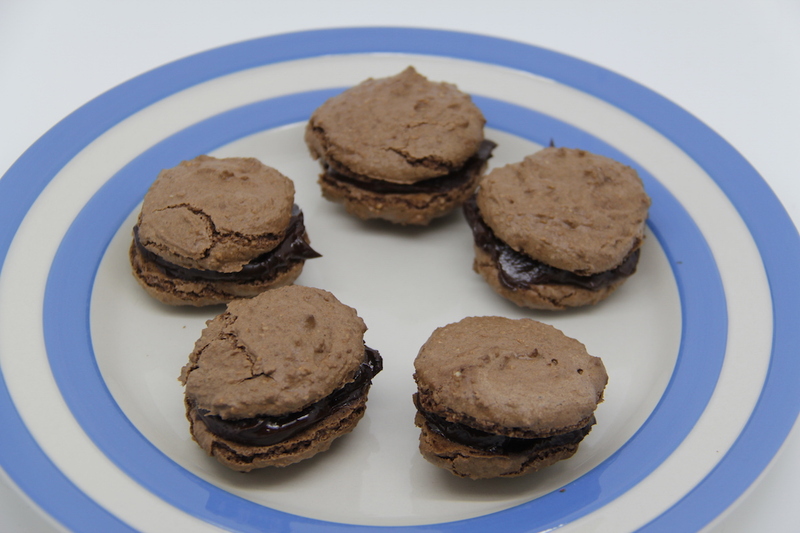 I also didn’t pipe them out – I mean really – do I look as if I have time to pipe out macarons and also the filling? Spooning the mix on the baking paper works fine and spreading the ganache inside with a spoon also works fine which then gives you more time for eating these and playing monopoly. They are gluten free which is a bonus and use up egg whites – we always have a lot of egg whites leftover from icecream making and I am always looking for ways to use them up. We ate these very quickly, very very quickly. I will be making them a lot! Ingredients: 100g walnuts, 75g icing sugar, 2 large egg whites, pinch of salt, 75g caster sugar, 25g cocoa powder. For the ganache: 100g Montezuma dark chocolate, 100ml double cream. Draw about 20 little circles (4-5cm diameter) on baking paper – you could skip this part I think as well, especially if you already know what a circle looks like. Put walnuts and icing sugar in a food processor and blitz into fine powder. Whisk the egg whites with the salt until it stands in soft peaks. Add the caster sugar a bit at a time and continue to whisk until it stands in stiff peaks. 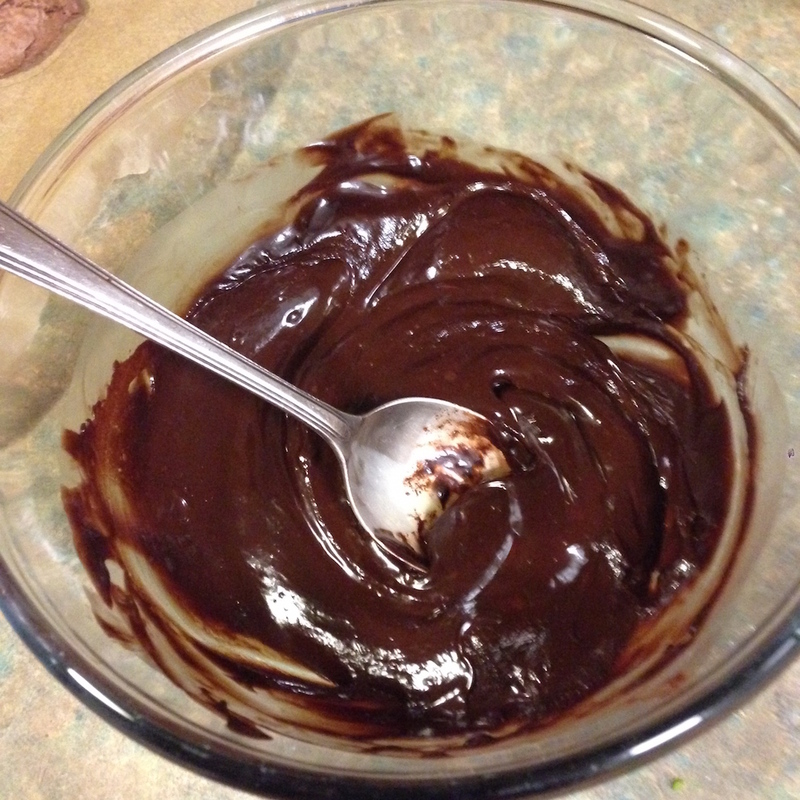 Sift the cocoa powder onto the egg whites and add the walnut/icing sugar powder and gently fold in with a metal spoon. Put large teaspoons of the mix into the circles and smooth out. You can smooth the mix with a spoon (or finger) dipped in water. When you have done all 20 bang the baking tray hard on the work surface and then leave for 30 minutes. 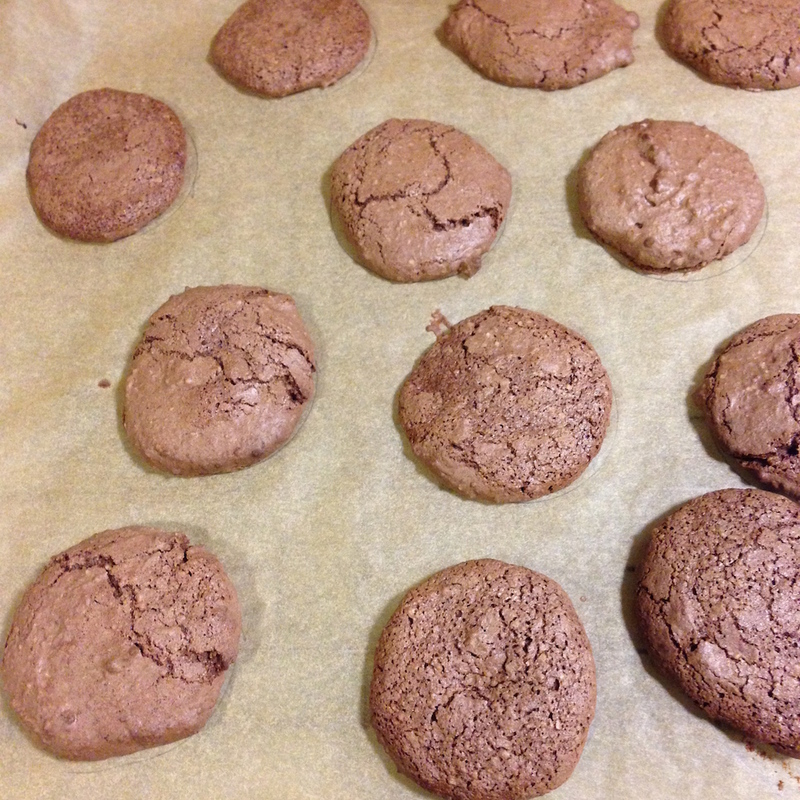 Bake in an oven 180C for 15-20 minutes and then move the macarons still on the baking paper to a wire tray to cool. Meanwhile make the ganache. Chop the chocolate into very small pieces. Heat up the milk until it steams, but doesn’t boil and pour gradually and slowly the milk onto the chocolate stirring. Leave to cool and harden up a little then spread onto the flat side of a macaron and top with the flat slide of another. HAPPY NEW YEAR – I hope 2015 bring peace and just a little excitement to you all.